AAHHH - Cocktail hats! Although I haven't worn them in years, I used to be a total fanatic. In my twenties, I was a ballroom/swing dancer who took a great liking to women's dress hats. They were hard to find, especially new, and often required some jazzing up. While I wasn't amazing at reinventing them, I did manage to cut up a few and recreate them into a shape that worked better for me. I inserted combs to anchor them to my head so that I could dance the night away without them slipping and even created a few as part of my costuming for performances. Then along came Princess Diana. Suddenly she was the focal point for hats and I began to get comments like, "Oh, you're wearing them just like Princess Di." Over night I went from leading a trend to following and that was it for me - the charm was gone. I still have a few boxed and stored for sentimental value, but haven't worn one in years. Locally I have noticed cocktail hats are slowly creeping back onto the fashion scene. First there was a Seattle designer several years that created very small funky cocktail glass type creations that perched on your head. I can't seem to locate any info on this designer now, so I am assuming she is no longer around. Then at a student show a while back, someone was wearing a small, folded sculptural version she had invented herself. Pret-A-Pour Tea (http://www.pretapourtea/) brought in hats as a theme at their 2009 fund raising event - a theme they continued in 2010 - and this week Blushing Boutique (http://www.blushingdesigns.com/) presented a selection of hats at their recent runway show much to my surprise (although I don't find them on their website). 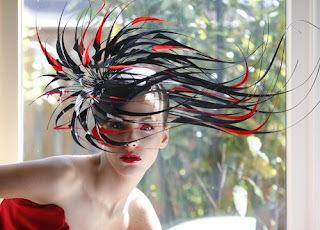 Of course, one cannot forget the iconic Edie Hats (http://www.ediehats.com/) which has always been a force on the hat scene and local milliner Alice Hart (http://www.alicehart.com/). 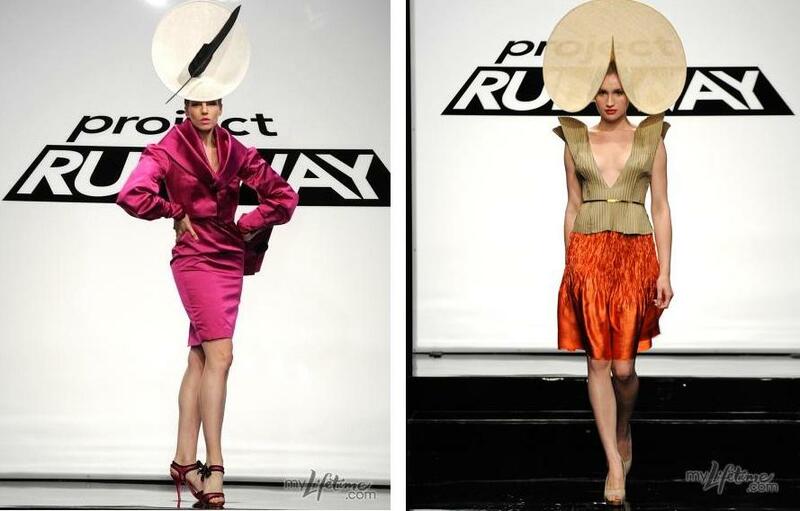 As I missed the entire last season of Project Runway, I have been watching the episodes a few at a time this week on my computer. 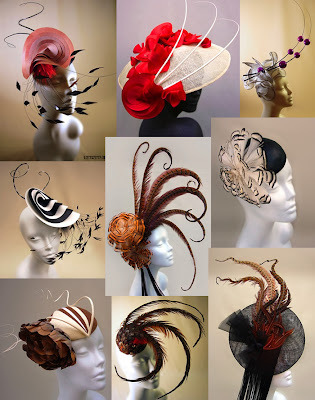 In episode four I was delighted to see they brought in world famous milliner Philip Treacy (http://www.philiptreacy.co.uk/) with a selection of his one-of-a-kind hats. 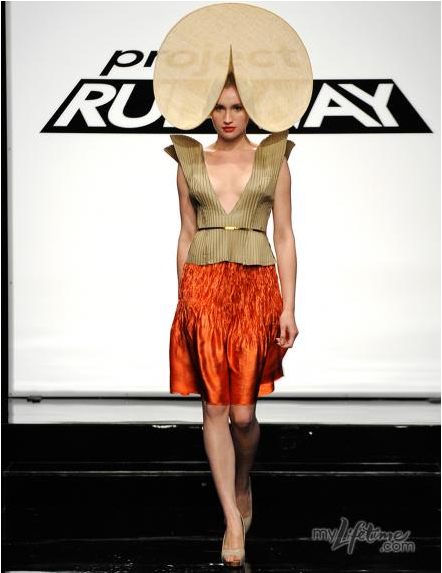 Each contestant was asked to design a dress to compliment the hat they chose. For those who may not know, the late Isabella Blow had a hand in making Treacy a household name when she fell in love with his hats and asked him to make one for her wedding. While his star was on the rise, he had a workshop in the basement of her home and accompanied her at both home soirees and out at fashion events. 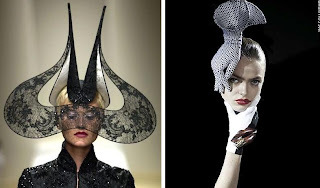 Now he is one of the super stars in the fashion world and has even created some of Lady Gaga's unique head gear. 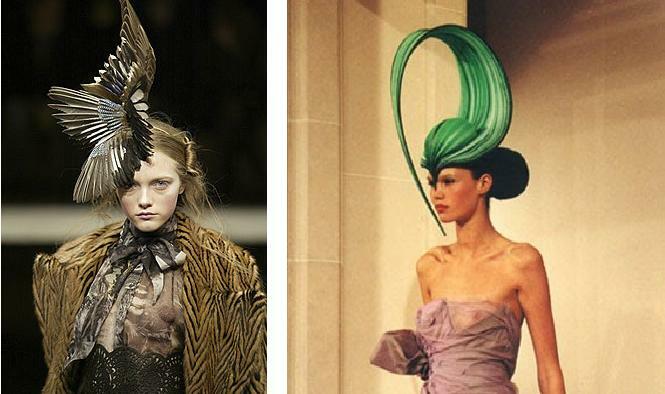 Treacy has taken hats into the realm of wearable sculpture, a transformation that has been amazing to watch. This is probably the designer whose work I covet the most. If I was rich I would be an avid collector. Europe is much more daring in their fashion aesthetic. They have embraced the re-emergence of hats as a part of one's fashion statement much more quickly than those of us in the West, especially the laid-back West Coast. As much as I would love to see creations like those displayed in this blog worn locally, I don't see it happening any time soon. I, however, would be happy to be seen in the black/lace version below left OR in the wind swept red/black feather creation shown after the first paragraph. All I need is a bigger fashion budget. For those locally longing to make a fashion statement of this magnitude, custom work is always available as are millinery courses. The sky's the limit, just bring your imagination.